Sure enough, a few weeks later after we observed multiple lessons together, it was clear that there were a number of different approaches teachers were taking to find materials, and the only commonality was how exhausted they were from all that searching. And across 16 observed lessons, 3 had materials that matched the expectations of the standard the teacher was targeting for the lesson. I’ve seen this confusion play out in schools in multiple states. We have a wide range of materials being used in American classrooms. What’s more, there is a wide range of ways that school and system leaders think about what kind of materials they want and what they “should” be doing with materials they have–even within the same subject in the same system. Everyone on a team benefits from a clear understanding of what they are trying to do together. If each member of a choir is holding a different songbook, the result will be a cacophony instead of a concert. It’s the same for schools; only when teams have a common understanding of the materials approach they want to take can they find the materials and provide the supports to allow that strategy to succeed. In our work with school leadership teams across the past three years, we have found there are two questions that need to be answered about the materials approach. The answers to these two questions then point the leadership team towards one of four pathways, and they are able to manage resources and supports in different ways for each of these pathways. Do we want to “make” or “take” our materials? “Making” means designing the instructional plan from scratch. When a teacher planned my integers unit and wrote a worksheet of problems about changes in altitude and debt and temperature–even if she referenced other sources for some inspiration problems–she was “making” her curriculum. And when her math coach and her colleague wrote a set of units that all teachers were to use and she hand drew the surface area net problems, she made that curriculum. “Taking” means using materials that someone else designed. When a school system adopts a textbook, it is “taking” that curriculum. When a teacher downloads a lesson set on Teachers Pay Teachers, she is “taking” that lesson or unit. Do we want “common” or “varied” materials? “Common” means we are all doing the same thing. This can be the expectation set by leaders or an agreement among a group of teachers, but the intention of all teachers in the same grade teaching the same general content would be a “common” expectation. For example, all teachers are doing a unit on the Great Gatsby and using the same materials as the starting point. They may each make some different instructional choices within the unit or lesson, but they are generally on the same page. “Varied” means each teacher is doing something different. When one 10th grade English teacher is teaching a unit on the The Scarlet Letter while her colleague down the hall is teaching other 10th grade students a unit on Macbeth, they have a varied approach. Each pathway has benefits and challenges, and each requires a different approach to supporting teachers and leaders to be successful. Making great materials (either for a whole district or for an individual class of students) is very complex work and takes a different set of design skills than we typically train or select teachers to do, even if we then expect them to do it. You have to know you have those skills on your team to do this well. It is easier to create strong support structures for teachers when using the same materials - whatever those materials may be - than it is to create effective support structures across different materials. You need to have coaches that can jump from one set of materials to the next with quick fluency for that to work. 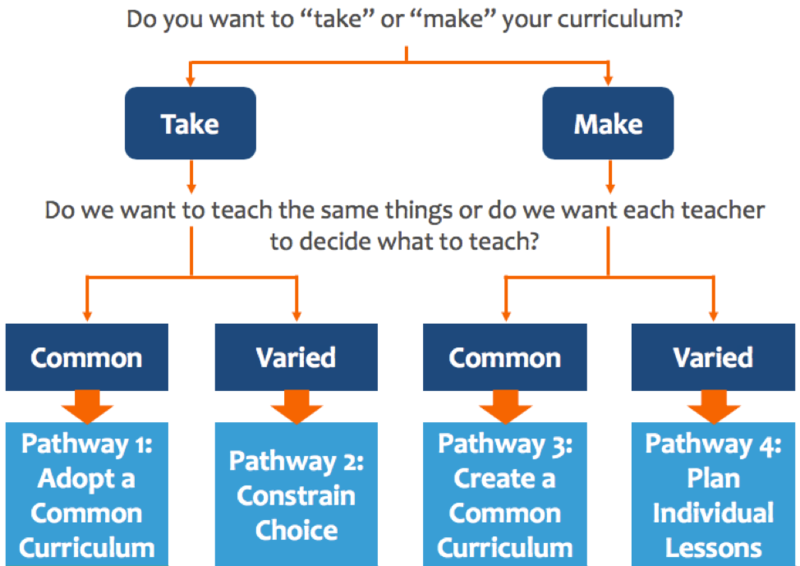 I think it is no accident that most of the school systems we have worked with across the past three years have ended up on Pathway 1: Adopt a Curriculum. However, I truly have seen examples of each of these pathways working. And I trust that educators are rational actors who, when they have the information about the trade-offs of each approach, pick wisely for their system. So, ultimately, I defer to the wisdom of informed teams. Above all, picking the pathway with clarity and commitment and making sure everyone knows which pathway you are on creates the conditions for success. Teams can select different pathways for different grade bands (e.g. in K-2 reading is on the Adopt a Curriculum pathway, but grades 4-5 are on Constrained Choice) or different subjects. Trying to manage multiple approaches in a single grade band is fundamentally confusing and inefficient for all involved. Whether it’s a crew rowing in the same direction or football players aligned on getting the first down, groups perform better with clarity of purpose. As systems consider their curricular choices, articulating a clear vision for the approach to materials can help teams get on the same page. I have thought about The Opportunity Myth every day since it was released, and I will continue to think about it every day for years to come. It is such a significant report, I want to elevate the value of reading this one closely – for understanding – and share how I am trying to make sense of it and what it is leading me to do differently. TNTP is the pacesetter of our field in storytelling, and they did it again – in fact, I would say this is their best work yet. It is an emotional view into the heart of daily instruction in American schools. I am sure randomized control purists will have methodology points of feedback, but as someone who observes about 200 lessons a year leading an organization that has seen about 3,000 classrooms, the report rings so true to the patterns I have seen play out across schools, grades, and state lines that I think the findings should be believed at face value. And that is what makes it emotional. SO WHAT DID THE OPPORTUNITY MYTH REVEAL? Students have big dreams: 94% of students surveyed aspire to attend college, and 70% of high schoolers have career goals that require at least a college degree. I don’t think grown-ups should dictate career aspirations of students (i.e. all kids should go to college), but I do think a meritocracy is based on the idea that students who have these aspirations should get the tools to pursue them. Well, it turns out, they want college. Students are working hard: Students were working on activities related to class 88% of the time. They met the demands of their assignments 71% of the time, and more than half brought home As and Bs. For the most part, students are pulling their weight. Students are underestimated – especially students of color – and they know it: Nearly 40% of classrooms that served predominantly students of color never received a single grade-level assignment. Compared to classrooms comprised of mostly students of color (>50%), classrooms with mostly white students tended to receive 3.6 times more grade-appropriate lessons. Reading The Opportunity Myth felt like seeing the roots of the achievement gap. You can’t help but mourn all the potential we are missing out on as a country. The only piece of my lived experience that I wanted to call out beyond the report is the fact base about just how hard teachers are working and how much they want to learn and grow and help their students. The ace in our pocket in this noble profession is our collective heart for students: no one enters teaching with malintent. The fact that daily instruction does not prepare students for their aspirations in sweeping numbers is happening alongside extraordinarily hard work and eager learning from the vast majority of educators. Both can be true. I spent almost a month teaching my 7th graders subtraction with regrouping, and it was the wrong decision. I did a pre-test, and a lot of my students were not able to do this basic skill, so I went back to 3rd grade. During that month, the students who already knew how to subtract were bored out of their minds, and the students who didn’t know (but had already sat through plenty of lessons on the subject) got little that was new. And they all felt talked down, too. They called it “baby stuff.” I lost a lot of time that could have been spent on understanding concepts like integers for the first time (concepts that could have easily reinforced the meaning of subtraction and place value that were the root of their regrouping misunderstandings). That month put my students further behind. And I will admit that I complained to my colleague teachers about how far behind students were (which was true) in a way that made it seem like there was nothing to be done about it (which was not true). Our paradigms about what we are supposed to do and our biases about who can do what work follow us straight into our daily instructional choices. We bring all the flaws of humanity to this human work of teaching, which is why we need a loving but challenging community to think through the choices we make and see them in a larger context. So rarely do we have time or space for this in the daily grind of school. However, The Opportunity Myth shows us the costs of our current paradigm. And invites us to reconsider. I want to become a student of history and understand the roots of the prevailing identity badges we educators wear that contribute to these widespread practices. I want to listen to people who have been doing this work longer than I have to understand their perspective. In our work with partners, I commit to looking more closely at the evidence of equity in access to high expectations - particularly for students in poverty, students of color, students with disabilities, and English Language Learners. Who is in this class? Who is not? Where are they? What are the expectations for their work? Why are they different? I also commit to look for evidence of equity in my daily interactions and decisions personally - knowing I can be a good person but also flawed and full of bias. I have been complicit in avoiding hard conversations about grading practices because they scare me. I know the emotions students and parents carry around grades, and I see how much easier it is to make it easier to do well. But if this adds up to sending the wrong signals to students and families about their true level of preparation, we simply have to wade into these waters. I commit to understanding grading approaches and options better, even if it is hard. I have never been in a school that does not have truly inspiring posters and artwork promising their students that if they work hard, they can achieve anything. Students should hear those messages every day, but they also need to see it in the work they are asked to do every day. And they know it when they see it. What does it take to implement a strong curriculum effectively? Click here to read part 1 of our curriculum white paper: What do we know about the experience of schools implementing rigorous curricula? Click here to read part 2 of our curriculum white paper: What happens in districts and schools where new instructional materials lead to greater student learning? As we continue to build out toolkits, we would love your partnership. Please share any resources here.